Parisian imprint Hard Beach Entertainment follow up some great releases by Corporation Mindfuck, DJ SCSI and Bastien Carrara with some old-school electro vibes by the mysterious Reflective Souls. This is their second release for the label. Beginning in bold fashion with the brooding retro bounce of “Doom 2020″ on the A side, but it’s on the flip where this 12” really shines. 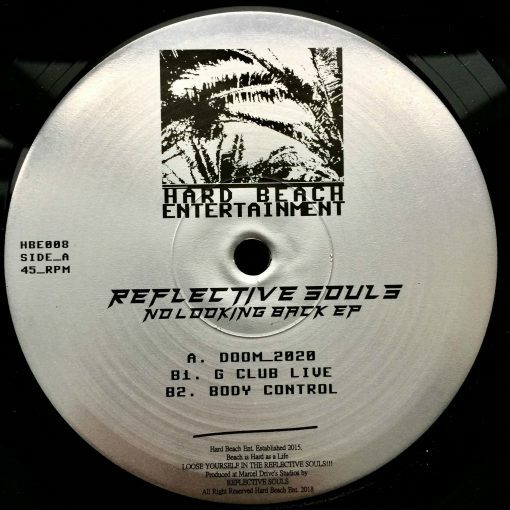 The evocative Motor City aesthetic of “G Club Live” was a particular highlight, while the tough electro-bass of “Body Control” has a wicked groove that’s more than capable of getting some heads-down moments on the dancefloor. More items from " Hard Beach Entertainment "
More items from " Reflective Souls "